Few events have shocked the American psyche as profoundly as the assassination of President John Kennedy on November 22, 1963. In the age of modern communication, news of the shooting spanned the entire globe in mere moments. Less than one week after the tragedy, a high-level decision was made to honor Kennedy by placing his image on the half dollar. The quarter had been considered, but Mrs. Kennedy requested that the portrait of George Washington not be removed from U.S. coinage. The Mint’s goal of producing Kennedy Half Dollars by January 1964 necessitated a very condensed timeline. Chief Engraver Gilroy Roberts was tasked with modeling Kennedy’s profile for the obverse. His assistant, Frank Gasparro, was responsible for adapting the presidential seal to the new half dollar reverse. On December 17, 1963, Roberts and Treasury Secretary Douglas Dillon met with Mrs. Kennedy and Attorney General Robert Kennedy. The designs were approved, though Mrs. Kennedy requested that the part in the president’s hair be less pronounced, plus a few other small changes. Work began quickly on tooling up for production of Kennedy Half Dollars. Congress also had matters to address. The current law required that coin designs not be changed for a minimum of 25 years. The Franklin Half Dollar had been around for only 15 years and could not be retired without the intervention of Congress. Legislation authorizing the Kennedy Half Dollar was finalized with bipartisan support on December 30, 1963. It was 12:40 CST (ten minutes into this video) on Friday November 22, 1963, that CBS interrupted its soap opera As The World Turns with a news bulletin: shots had been fired at President Kennedy's motorcade in Dallas and that first reports indicated the president was seriously wounded. Less than one hour later, an emotional Walter Cronkite announced the death of President Kennedy. For the next three days, the TV networks broadcast non-stop, as the nation watched in collective grief. With Kennedy's death, much of America's self-confidence and optimism perished with him. The remainder of the 1960's were filled with social turbulence, fueled by opposition to the Vietnam War, and the rise of the counterculture. Proof dies were ready on January 2, 1964. Coining of the first Kennedy Half Dollar Proofs commenced immediately thereafter. Production of regular business strikes began at the Denver Mint on January 30. The following week, the Philadelphia Mint started regular half dollar coinage. Highly publicized ceremonies were held on February 11, 1964 at both the Denver and Philadelphia Mints, to commemorate striking of the new half dollars. The prevailing sentiment surrounding the occasion was that the coin was both an enduring memorial and an expression of sorrow for the sudden loss of President John Kennedy. By March, tens of millions of Kennedy Half Dollars were being distributed, but that wasn’t enough to meet worldwide demand. No United States coin has ever been more greatly hoarded than the 1964 Kennedy Half Dollar, as nearly every example released was set aside as a cherished memento in the emotional aftermath of November 22, 1963. In all, about 430 million of the 1964 half dollars were issued (more than half of these were actually struck in 1965 and 1966), many of which never saw the light of day. In response to increased coinage needs and looming silver shortages, the dime and quarter were composed of a cupronickel clad alloy, beginning in 1965. Seemingly overnight, coins containing 90% silver disappeared from view. The silver content of Kennedy Half Dollars was not completely eliminated, but was reduced to 40%, to partially appease silver mining states. The 40% silver alloy was utilized 1965 through 1970. From 1971 to the present, Kennedy Half Dollars intended for general circulation have been made of the cupronickel clad alloy. The United States observed its 200th birthday in 1976. The reverse of the quarter, half dollar, and dollar coin were replaced by bicentennial themes in 1975 and 1976, in keeping with the nation’s celebratory mood. Philadelphia’s Independence Hall, the place where the Declaration of Independence was signed on July 4, 1776, was depicted on the Kennedy Half Dollar. The familiar reverse bearing the presidential seal reappeared in 1977. 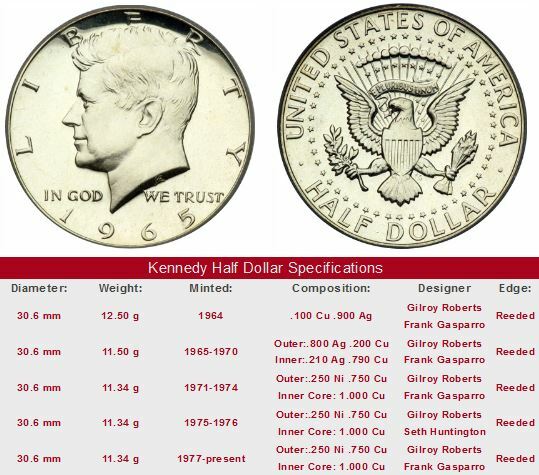 Kennedy Half Dollars have never circulated to the extent of its half dollar type predecessors. The explanations for this are varied, but the most logical argument is that for several years following its release, the Kennedy Half Dollar was venerated as a souvenir and not meant to be spent. Under this mindset, the half dollar vanished from everyday pocket change as the American public simply got out of the habit of using the coin (remember, by 1965, Franklin Half Dollars were hoarded because of their silver content). Some merchants today react as if they don’t know what to do if handed a Kennedy Half Dollar. There really are not any Kennedy Half Dollars that can be classified as key dates, per se. This is not to say there are not valuable coins belonging to this series, however. Some MS-70DC examples, which, by definition are perfectly preserved and complemented by a Deep Cameo luster, have risen astronomically over time. Leading the way are the 1968-S, 1973-S, 1974-S, and 1776-1976-S (40% silver type). All of them are worth at least $3000 each. Other MS-70DC Kennedy’s that have done well include the 1988-S, 1996-S clad, 1999-S clad, and 2000-S clad. This is just a partial listing, but there are a few more. Point of Understanding: We are talking Deep Cameo (abbreviated DC or DCAM), not just Cameo (abbreviated C or CAM). There is a difference. Anything short of MS-70DC seriously dampens the value for members of the Kennedy Half Dollar class. If you set your sights on obtaining utter perfection, you absolutely must not settle for coins described as such, but which have not been certified by either of the most respected third party certification services: PCGS, NGC, ICG, or ANACS. An MS-70DC label applied by anyone else will not garner the same respect. The challenge of finding a flawless example, especially of the dates listed above, is significant. After all, how often does one ever discover perfection in anything?